There’s no denying that Italian cuisine is among the most popular in the world. Many international chefs have certainly mentioned that often enough. And the number of Italian restaurants you can find in every major city is a glaring testimony to that. But more than all the scrumptious pastas, yummy pizzas, and hearty soups in Italian cuisine, it is the dessert that will almost always top the list in leaving sweet lasting impressions on your senses. You doubt this? Munch on a cup of chocolate gelato or a pistachio tiramisu and let’s see if you still have doubts after that. 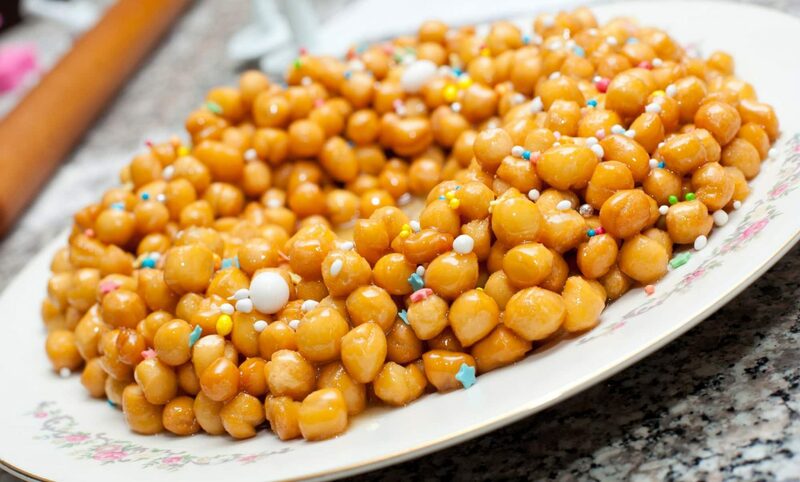 One such amazing authentic Italian sweet treat is the Struffoli, a Christmas dessert typical of the Campania region. But before we get right down to checking an authentic struffoli recipe, let’s find out more about this pastry first, shall we? A holiday favorite of both the young and the old in Italy, the authentic struffoli recipe calls for rolled dough balls of around 3/4 of an inch in diameter. The balls are deep fried until crisp or golden brown. Typically, it is assembled, one on top of the other, like a dome or pyramid on a plate. And then it is topped with sprinkles, sugar sand, or bits of candied fruits. It is usually served during special occasions or festivities. It is also relatively sweeter than most pastries as it is drizzled with honey and topped with sugary decorations. Although, you can totally adjust the honey mixture and toppings according to your preference. It’s no wonder then why it is a crowd favorite. The word “struffoli” actually comes from the Greek word “strongoulos”, which means shaped like a ball or round in shape. According to some historians, this dessert may have been inspired by sweet fritters called “loukoumades” during the Magna Grecia era in southern Italy. Another possible influence on this popular holiday pastry is the Spanish piñonate. It basically has some of the same ingredients as the struffoli. However, its shape is like a tube and it has anise. This dessert is known to be a staple during the Christmas season. In addition to that, the traditional struffoli recipe also calls for a Neapolitan anise liquor. But it’s somewhat hard to find today. So most people simply use rum or brandy as alternatives. However, this ingredient is actually optional and you can still create these scrumptious honey balls without it. In Naples today, struffoli is mainly a holiday treat. But for the rest of Italy, it is prepared and available during most festivities, especially religious holidays. You can even easily spot it during Carnevale. Like many other traditional Italian dish, the authentic struffoli recipe has similarities with other desserts in other parts of the country. One pastry that has some similarities with struffoli is Cicerchiata. Typical of the Abruzzo region, this honey balls are prepared the same way and basically have the same ingredients. And it is also typically served during the holidays. 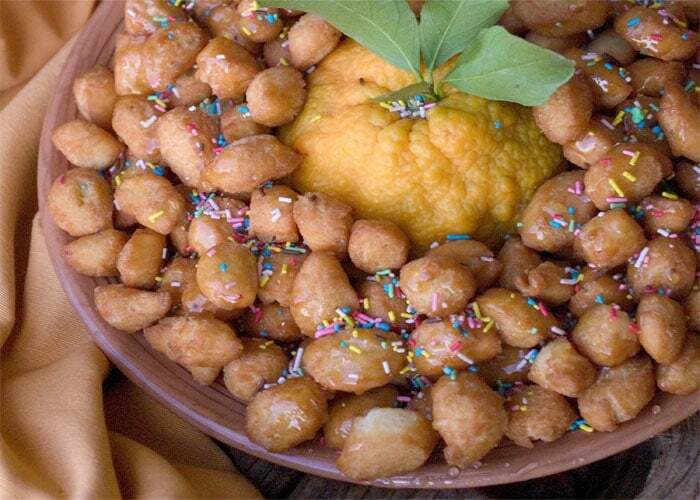 Another version of struffoli is the “porceddhuzzi”, which is typical of the Calabria region. Instead of being shaped as balls, however, they are shaped as dumplings. 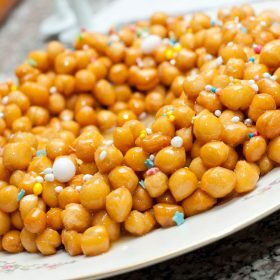 And there’s also the Sicilian version called “mpagnucate”, which is mainly served during Carnevale and is crispier than struffoli. Struffoli is quite easy to make because the authentic struffoli recipe doesn’t require complicated techniques. And you do not need to wait for a special occasion or join the Carnevale to enjoy this dessert. 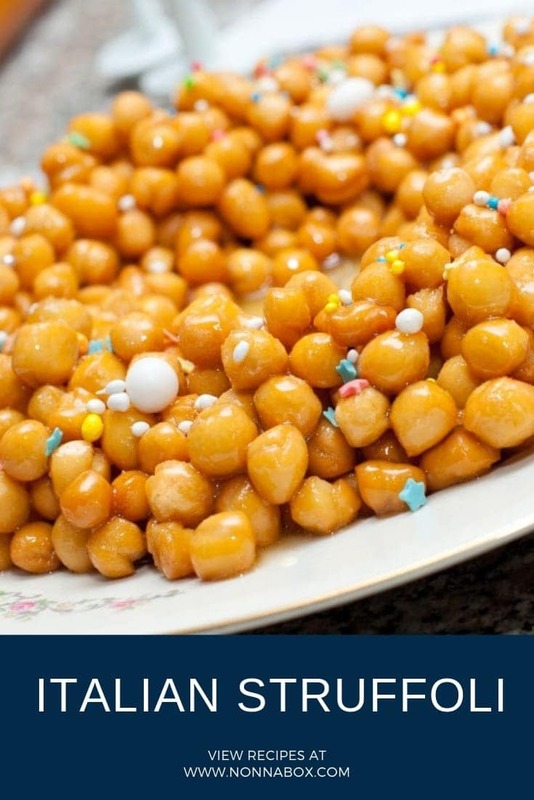 We recommend you refer to our recipe below for an authentic Italian Struffoli experience. There are quite a number of struffoli recipes floating on the web today. But basically, struffoli is just fried dough with drizzled honey and topped with sprinkles. Want to take a whack at making some yummy honey balls? Below is an authentic struffoli recipe you can try at home. This recipe is traditional to the Campania region of Italy and it is usually made during Christmas. Although you can make it whenever you can! Mix the flour, lemon and orange zest, sugar, salt, and baking powder. In a food processor, mix the dry ingredients with butter. Blend until all the lumps of butter are almost gone. The mixture should resemble a coarse meal. Slowly add the eggs and vanilla extract. Blend until the dough becomes something that resembles a big ball. Cover the dough with a saran wrap and keep in the refrigerator for at least 30 minutes. Next, roll the dough into thick cords of about a quarter of inch thick. Cut the dough into portions of about half an inch and roll each into small balls. Each dough ball should be about the size of a regular hazelnut. Lightly dust the dough balls with flour. Make sure to cover every one but make sure not to put too much flour. In a saucepan, put some oil over medium heat. Keep track of the temperature using a thermometer. Heat it up until it reaches 375° Fahrenheit. Fry the dough balls in batches. It should take around two to three minutes per batch. Dough balls should be a light golden brown. Meanwhile, line a serving plate with paper towels. Once the dough balls are done, place them on the plate and let the paper towels absorb the excess oil. Combine honey, lemon juice, rum (or brandy), and sugar in a saucepan. Cook the mixture under medium heat. Continuously stir the honey mixture with a spatula, and cook until all the sugar is completely dissolved. Once it’s done, turn off the heat and add the fried dough balls carefully into the mixture. Stir the mixture carefully, making sure not to damage the dough. Once all the dough balls are covered with the honey mixture, transfer them to a serving plate. Set the remaining mixture aside. Meanwhile, arrange the dough balls around the serving platter, leaving a hole at the center. You may place a glass in the middle so that you can estimate the hole you are creating. You can also simply make a mound of dough balls at the center, if you want an easier assembly. After you’ve assembled the dough balls on the serving plate, carefully pour some of the remaining honey mixture on top. Put as much as you prefer. Next, cover the dough balls immediately with sprinkles, confectioner’s sugar, or any other edible decorations on top. With this easy recipe, you can now enjoy this authentic Italian dessert at the comfort of your own home. And you no longer need to wait for Christmas or any special occasion to be able to munch on them. Serve these during special family get-togethers, birthdays, or just whenever you’re craving for these sweet stuff. After all, any day can be a day for some struffoli. Don’t you agree? Can’t wait to try this.. 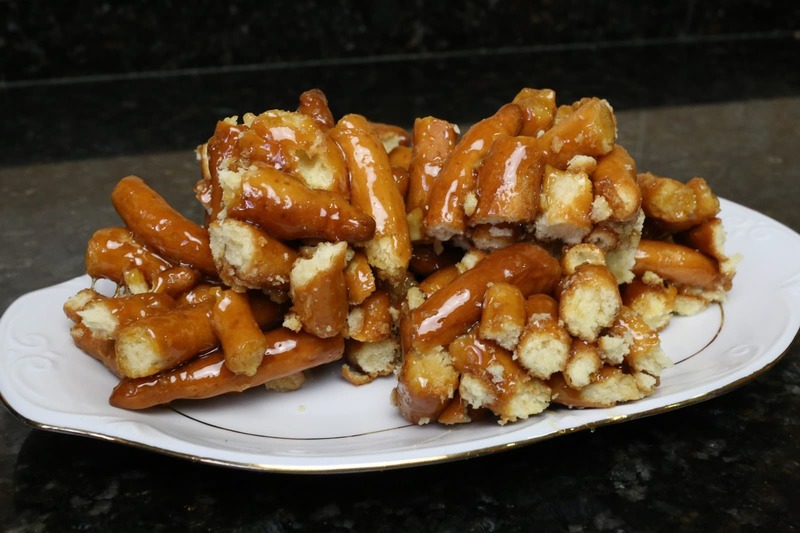 Thank you for sharing this authentic struffoli recipe…. it’s good for dessert. The kids loved it very much. I’m making a lot of this again this coming holiday season. Yay! Excellent…this recipe is a winner.! Thank you Nancy for stopping by! I have almost the same recipe from my great grandma. The only differences are, I put the rum in with the dough, also fry some lemon and orange peel (no pith) in the oil before frying dough then remove, (she always did that for any fried dessert) and the recipe is multiplied by 5! Yes, makes enough for the entire family to take home! Great to see it! THX! Wow, it’s great to hear that recipes can be similar. Thank you for stopping by Francine and Buon Natale! The recipe is very good I had to double all the ingredients to make two plates. I used spiced rum in the dough and in the liquefied honey. Glad it turned out great for you! Buon Natale!